Every key on a telephone keypad has its own sonic signature, a sort of calling card composed of two distinct tones: one high, one low. While it’s easy to tell the difference between the individual pitches in a single row—see, for example, this article on using your cell phone as a musical instrument—, it’s often difficult to differentiate between notes within the same column. Unless, of course, you outsource the work to a computer! Which is what Uruguayan hacker [Charlie X-Ray] recently set out to do. With a little help from Python and Audacity, Charlie came up with a method of extracting phone numbers from video clips featuring audible key presses. 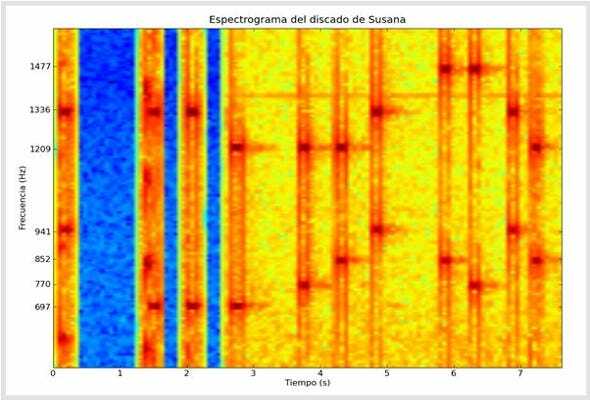 The results output to a neat, easy-to-read spectrogram. Moral of the story? Don’t let the camera hear you dial if you want to keep a number private! Interested in trying it out yourself? You’ll find complete details on Charlie’s website (Google translation). This post originally appeared at WonderHowTo.